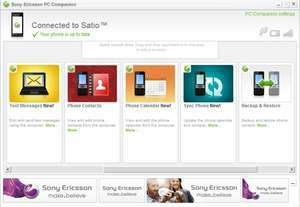 Sony Ericsson PC Companion (the counterpart to Mobile Phone Tools) is Sony Ericsson mobile users' gateway to Sony Ericsson features such as software updates, user manuals and service, support and guides. Using this tool with your mobile phone is rather simple and involves connecting your phone to your PC with a USB cable, connecting it with the phone (tap USB Connected > Mount) and wait for the PC Companion to recognize the device. When your phone has been connected and recognized from within the SE PC Companion, you'll be able to access services and applications which are supported on your current handset. You will also be able to backup data and synchronize data between your PC and phone. Version 2.10.115 is a freeware program which does not have restrictions and it's free so it doesn't cost anything. Sony Ericsson PC Companion has a presence on social networks.